Just 48 hours to go and we find that our hotel has been substituted for another. This is not normally a good start to a holiday but in our case it couldn’t have turned out better. Our original destination was undergoing a little construction work so we were diverted to Galley Bay, owned by the same group. The first impression of this hotel is “where is it?” A small reception desk sits in its own building just off the road. We checked in and were offered a drink (the rum punch was one of the best ever). Suitably refreshed, we and our luggage were driven in an electric buggy through the surrounding garden and along a small path which crosses a lagoon, actually a wild-life sanctuary. At the other side of the lagoon our route took us passed modest single story buildings housing a number of the guest facilities including a library, gym, cycle store, spa treatment rooms and tennis court, but still no evidence of any traditional hotel building. The reason for this soon becomes clear, there isn’t one! 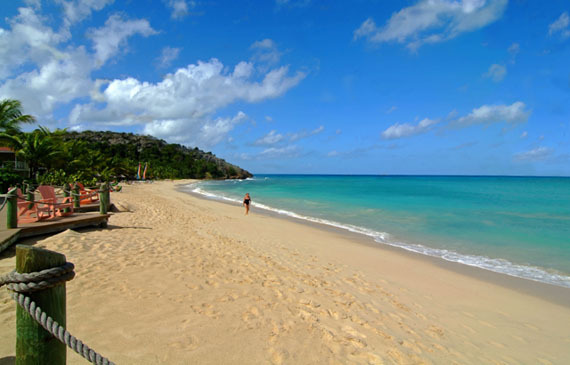 We stopped and our driver showed us a small customer service desk behind which is a little shop, and then magnificent Galley Bay opened up before us, a gently curving expanse of beach around three-quarters of a mile long, fringed by palm trees. The hotel rooms are built below tree height and spaced out along the bay, so there is no concrete edifice to spoil the view. Most face the sea but a small number of ‘rooms’ face the lagoon. 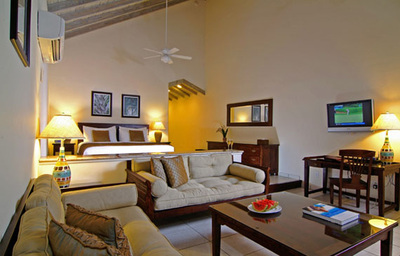 These Gauguin suites consists of two small buildings, one a bedroom, the other a bathroom. They are linked by a covered walkway with plunge pool. Each is discreetly screened to offer privacy and favoured by honeymoon couples, so it you fancy a skinny dip before breakfast, these are the rooms you should book! The all-inclusive hotel does not allow children under 16 . 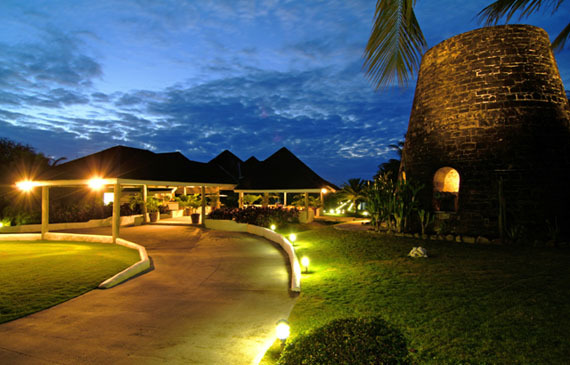 Its long stretch of beach and 40 acres of tropical gardens are thus home to less than 250 people; no wonder it is so peaceful and relaxing. Across an inlet at one end of the bay there is a small incline where Giorgio Armani has a home overlooking the bay; what a great view he has! 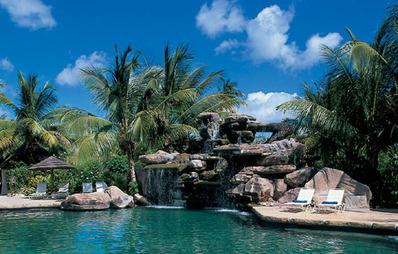 The delightful swimming pool is in a tranquil garden setting and is enhanced by an attractive waterfall feature. If you are feeling active then there are non-motorised water sports, bicycles you can borrow, a tennis court and a gym - that is if you can tear yourself away from the peaceful beach and pool. Food and service match the great surroundings, the staff are friendly without being too familiar and give the impression that they really enjoy working there, an impression that seems to be genuine given the length of service of many of the employees. There are three bars and restaurants, one at either end of the bay and on in the centre. 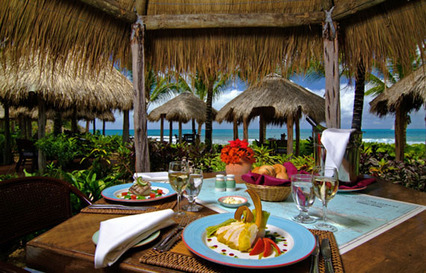 Each table in the Gauguin restaurant sits under its own thatched gazebo, dotted around in the tropical garden, each table is accessed by its own path. Serving staff sometimes cough politely when approaching in case guests are over-influenced by the romantic setting. 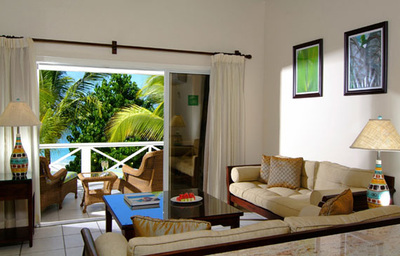 In addition to the Gauguin rooms mentioned earlier, there are three categories of rooms on the beach and facing the sea. All come with their own loungers and palm trees should you want some shade. We were lucky enough to be given a premium beach-front suite. There are two ground floor and two first floor suites in a single building and each consists of a sunken living area leading onto the balcony, a raised bedroom area and a huge bathroom with 'his and hers' basins and 'his and hers' showers. Our mini-bar was stocked with a selection of drinks but the staff were happy to stock it with whatever we wanted. 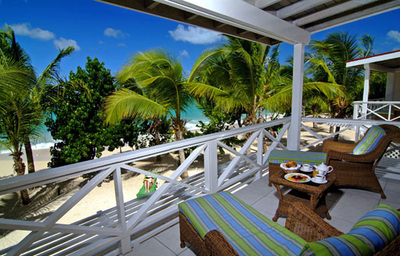 ​Antigua is famous for having 365 beaches, one for each day of the year. Quantity isn’t everything but if it’s quality you value, Galley Bay takes a lot of beating. The hotel is anxious to meet all the needs of its guests but it does so with the lightest of touches. It’s there when you want it and it disappears into the palm trees when you don’t, leaving you to relax in its beautiful surroundings.